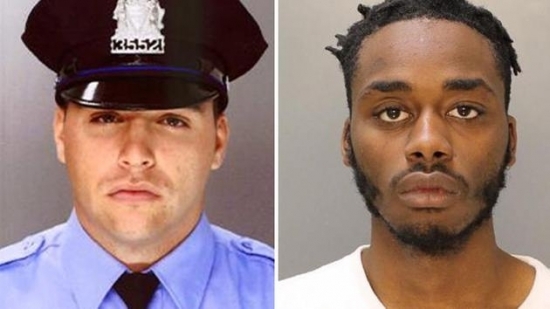 Philadelphia Police have identified and apprehended the suspect wanted for shooting a police officer on Sunday night in West Philadelphia. Narcotics officers observed 23-year-old Scott Griffin on the 1200 block of Alden Street and arrested him around 1 p.m. this afternoon. Last night around 9 p.m. in the area of 59th and Market Streets, a woman approached officers saying two men had just carjacked her. Officers approached the car and the men jumped out and ran. 24-year-old Officer James McCullough pursued. Griffin opened fire and hit McCullough in the leg. McCullough returned fire but did not hit Griffin. The other suspect 20-year-old Samir Coyett was caught at the scene. McCullough was taken to Penn Presbyterian Medical Center and is in stable condition. He is a 2-year veteran of the force. He is also engaged and has a 2-year-old daughter. 30-year-old Maurice Phillips has been arrested and charged with the shooting death of his 4-year-old daughter, Tahriah, in their Kensington home over the weekend. It happened at 2:25 p.m. on Saturday on the 200 block of East Mayfield Street. Tahriah was in a bedroom with her six siblings watching television. Maurice was recklessly waving a gun about when it went off. The single gunshot struck the girl in the head. He fled the scene when the mother came home, but later turned himself in to police and confessed. He is charged with third degree murder, involuntary manslaughter, endangering the welfare of children, recklessly endangering another person and related charges. Police have identified and arrested a man in connection with the shooting death of three people and wounding of a fourth in Kensington early Sunday morning. 46-year-old James Elijah Dickson of the 600 block of East Westmoreland Street is charged with three counts of murder, one count of attempted murder and related crimes. Dickson called 911 and reported the shooting. Police were called to his address at 4 a.m. and he refused to come out. After a tense standoff Dickson eventually was taken into custody. An argument apparently led to the shooting. Dickson's brother, his brother's girlfriend, and another man had been killed with a shotgun. A fourth victim was only injured and was able to escape. He was taken to Temple University Hospital with non-life-threatening injuries.